If you like Popular Information, forward it to someone who might enjoy it too. If you’ve been forwarded this newsletter, sign up at popular.info. I want to hear from you about what I can do better. Send your feedback to judd@popular.info. Trump has nominated Brett Kavanaugh to be the next Supreme Court Justice of the United States. If confirmed, Kavanaugh could give the right-wing a stranglehold on the court for a decade or longer, transforming abortion rights, voting rights, and workers rights in America. The conventional wisdom in political and media circles is that Kavanaugh’s confirmation is a foregone conclusion. To be sure, with Republicans in control of the Senate, it is the most likely scenario. But it’s not a certainty. The perception that Kavanaugh’s confirmation is an inevitability has been carefully cultivated by Republicans. After all, what advantage is there for red state Democrats like Joe Manchin or Heidi Heitkamp to oppose Kavanaugh’s nomination if he’s going to be confirmed anyway? Why should activists spend time pressuring wavering Republican Senators if the outcome is predetermined? Why should donors finance anti-Kavanaugh TV ads if the fight is already lost? For Kavanaugh to be confirmed, Republicans need 50 votes in favor of his confirmation. (Pence would then cast the tie-breaking vote in favor of confirmation.) They don’t have the votes yet. Until the votes are cast, anything is possible. Republicans currently hold 51 seats in the Senate. John McCain, Arizona’s Republican Senator, passed away on Saturday, after a 13-month battle with brain cancer. But Arizona Governor Doug Ducey (R) will soon name McCain’s replacement, and Arizona law requires Ducey to select a Republican. At this point, no Democrats are publicly supporting the Kavanaugh nomination. So the math is simple: If all Republicans vote to confirm Kavanaugh, he will be confirmed. But if two Republicans oppose his nomination -- and no Democrats support him -- Kavanaugh’s nomination will fail. The best chance for Republican defections in the Senate are the two pro-choice members of the GOP caucus, Susan Collins (ME) and Lisa Murkowski (AK). Kavanaugh could be the fifth vote on the Supreme Court to overturn -- or dramatically weaken -- Roe v. Wade. Do Collins and Murkowski want their legacy to be casting the deciding vote for a justice that will reverse or erode the constitutional right to an abortion? Collins and Murkowski have shown a willingness to stand up to their party in the past, voting (along with McCain) against Republicans’ last-ditch effort to repeal Obamacare. Collins met with Kavanaugh last Tuesday and, while she did not announce her support, she seemed pleased with what Kavanaugh told her about Roe v. Wade. “He said that he agreed with what Justice Roberts said at his nomination hearing in which he said [Roe v. Wade] was settled law,” Collins said. This is a talking point that many Republican judicial nominees have used to avoid answering questions about their views on important legal issues. A judge can believe a decision is “settled law” and still vote to overturn it. Roberts spent his entire confirmation hearing pontificating on his respect for Supreme Court precedent. But he recently voted to overturn a 41-year-old case, unequivocally “settled law," to gut public sector unions. Collins said she would not make a decision on how she would vote until after Kavanaugh’s hearing, which starts September 4. Collins faces reelection in 2020, and a vote for Kavanaugh could imperil her chances. A recent poll found 47% of Mainers said they would be less likely to vote for Collins if she votes to confirm Kavanaugh. Just 31% said a vote for Kavanaugh would make them more likely to support Collins. Kavanaugh himself is the “most unpopular court pick in decades.” 40% of Americans oppose his nomination and just 37% support, according to a recent CNN poll. Murkowski had her own meeting with Kavanaugh on Thursday and was more circumspect than Collins. “Today’s meeting represents an important step in my vetting process. That process, however, has not concluded,” Murkowski said. Three Democrats, Joe Donnelly (IN), Heitkamp, and Manchin voted for Trump’s last nominee, Neil Gorsuch. So far, none of the trio, who are all up for reelection in November, have announced their support for Kavanaugh. In his career as an attorney and judge, Kavanaugh has amassed a lengthy paper trail. There are 910,000 pages of documents from his two-year stint as associate White House counsel for George W. Bush, 2,935,000 documents from his three-year tenure as Bush’s staff secretary and 20,000 pages from his work investigating Bill Clinton with special counsel Kenneth Starr. With just days before his September 4 hearing, only 6% of these documents have been provided to the Senate and even fewer have been made public. Most of the documents are maintained by the National Archives at the George W. Bush Presidential Library. But the Archives told Senate Republicans they wouldn’t be able to complete their review until the end of October. So Republicans have created an entirely separate process where GOP lawyer Bill Burck, who used to work for Kavanaugh, is reviewing the documents at the Bush library and releasing them as he sees fit. Senator Chuck Grassley (IA), the Republican chairman of the Judiciary Committee, has not even requested a list of documents that Burck determines are privileged. The Kavanaugh documents could provide insight into his views about any number of issues but one, in particular, looms large: executive power. Kavanaugh could quickly find himself in a position to rule on criminal cases involving the president who nominated him. He could be the deciding vote on whether a sitting president can be subpoenaed or criminally indicted. There is speculation that Trump selected Kavanaugh due to his expansive view of executive power. The documents could provide insight into just how much deference he will show Trump. One possibility for John McCain’s replacement is his wife, Cindy. This would be a sentimental choice, allowing McCain’s wife to carry on his legacy at least until 2020 when an election for the seat is held. Cindy McCain, however, told CBS News in 2008 that she supports abortion rights and does not want to repeal Roe v. Wade. Senator Jeff Flake (AZ) would like to be known as someone who stood up to Donald Trump. But Flake is retiring, and the Kavanaugh nomination is probably his last chance to back up his words with action. Flake has not yet committed to voting for Kavanaugh. But he seems inclined to do so. Perhaps the criminal information filed against longtime Trump attorney Michael Cohen, which names Trump as an unindicted co-conspirator, might change his mind? On Sunday, two people were killed, and nine others were wounded when a gunman opened fire at a video game tournament in Jacksonville, Florida. The suspect, identified as David Katz, a 24-year-old white man, also took his own life. The incident was the 233rd mass shooting in the United States recorded by the Gun Violence Archive in 2018. The nonprofit defines a mass shooting as one where four or more people are shot at the same time and place, not including the shooter. The United States accounts for 5% of the world’s population and 31% of the world’s mass shooters. Overall the gun homicide rate in America is 25 times higher than other high-income countries. One differentiating factor: the ubiquity of guns. There are 89 guns in the United States for every 100 people, far outpacing any other country in the world. Studies have found no link between video games and gun violence. South Korea, for example, has extremely high consumption of video games -- more than double the United States -- and almost no gun violence. The players at this tournament, moreover, were competing at Madden NFL Football. If you like Popular Information, tell someone about it! Tweet your thoughts and include the URL popular.info. 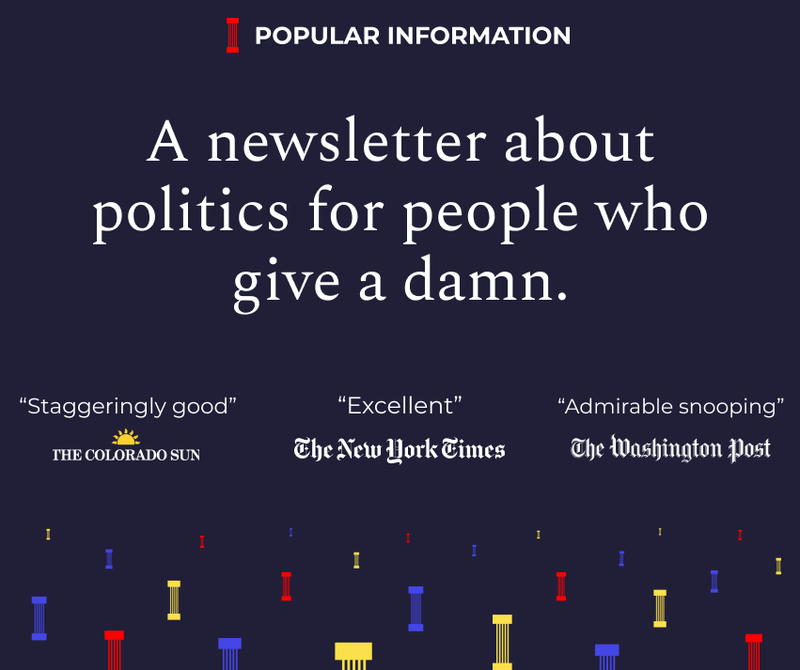 A simple, no-nonsense well written newsletter. If you like it, click on the red "I" column at the top left to subscribe. And the best? No advertising. Must read 👇 @JuddLegum outlines the next phase of Trump's strategy to shut down Mueller.